Churchill: The Prophetic Statesman reveals the astonishingly accurate predictions of Britain's most famous prime minister and how his critics' perceptions of them shaped his political career. Who could have foreseen the start of World War I twenty-five years before the assassination of a Serbian archduke plunged Europe into war? Who could have predicted the rise of al-Qaeda nearly eight decades before anyone had heard of Osama bin Laden? Winston Churchill did. Now for the first time, bestselling author James C. Humes reveals these and other shocking predictions made by this legendary figure. Churchill didn't need a crystal ball to tell the future. Using his skills as a historian, he studied patterns of the past to make his eerily accurate forecasts, including the rise of European fascism, the fall of the Iron Curtain, and the exact day of his own death as he entered his final years. 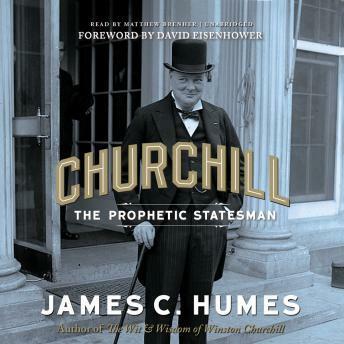 In fascinating detail, Humes' astonishing biography documents the spot-on prophecies Churchill foretold and the political consequences he endured for sharing them.